Oh my goodness, this is so good!! It is lightly caramelized with a wonderful butter flavor. The best thing though, is no kernels or hulls getting in your teeth. You better make a double batch. It will go fast. In medium sauce pan, combine butter, brown sugar, and corn syrup (or honey). Stir constantly while bringing to a boil over medium high heat. Once boiling, allow to boil for one minute. Remove from heat and stir in baking soda. Mixture will foam. Stir until well blended. 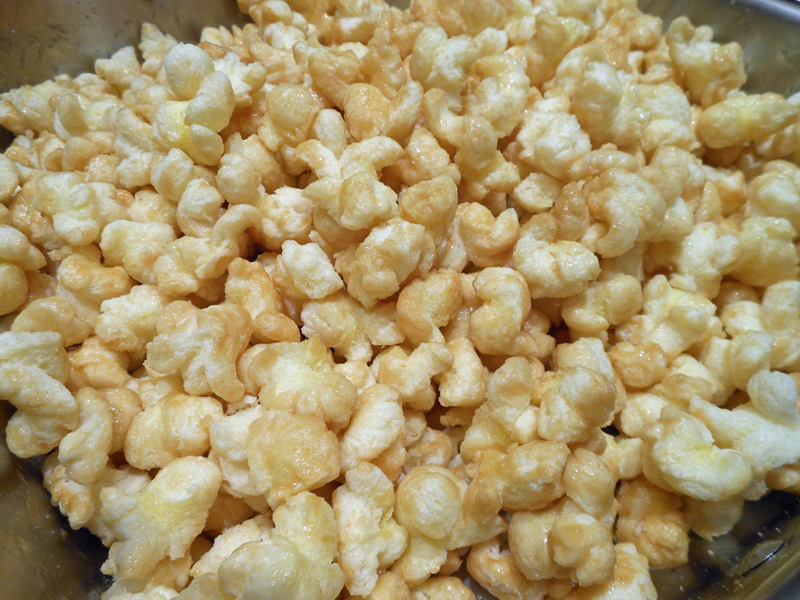 Pour over puff corn. Stir really well to coat. Bake at 250 degrees for 45 minutes, stirring well every 15 minutes. Allow to cool and store in an airtight container. Sounds GREAT! Dixie, I have a recipe just like this that’s finished off in a big grocery bag in the micro.